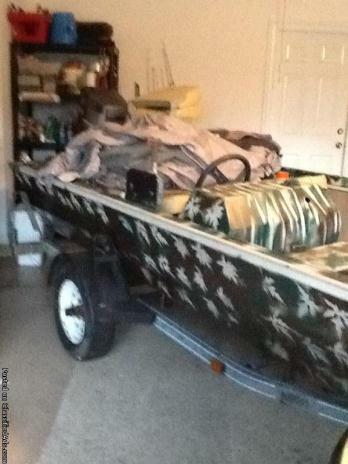 This is a nice boat for fishing or duck hunting. Recently painted camouflage pattern. New carpet, New seats, New trolling motor, New batteries, New fish finder, New anchors, and New spare tire for trailer. 26 foot pontoon boat for sale. 115hp mercury.New starter, steering cable, new navigation lights. Contact for more info. WAIT LOOK!!!!!!!!!!!!!!!!!!!! I have a party bage for sale its in great condition the has a tralor and side rails for protection this boat is huge we have fit about 14 people and still had lots of room on it. the motor is a 65 hp motor it did have a 25hp motor but that motor broke the motor thats on it need a water pump but that shouldn't cost much. and the only reson were selling it is because we have no need for it and no more room we have 4 boats including the barge. no pics because my camera broke but i garentee you'll love it. great for entertianing.. i'm selling this boat for my grandpa so when you call ask for bennie but if he's not home be sure to leave a message. call 318-797-7531. please call..